When we woke up this morning, we thought that our string of summer days was going to end at one. There was a relatively thick fog and it was raw, with the temperature around 62 degrees. 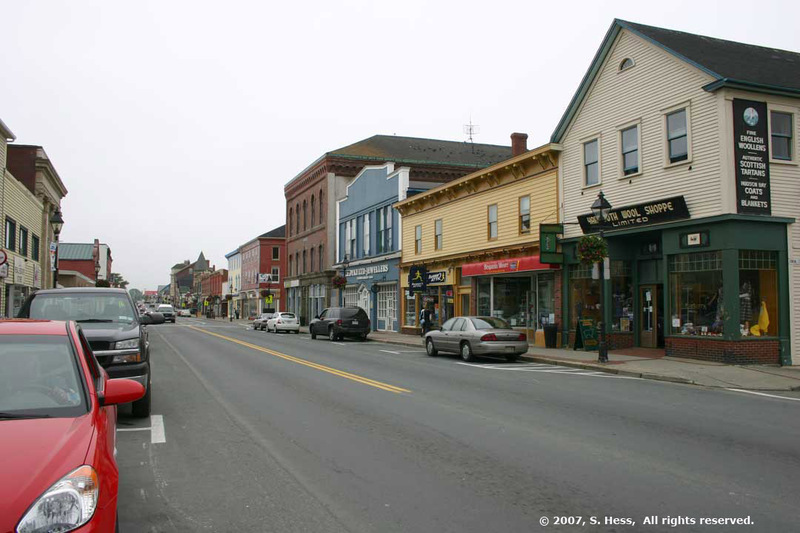 Our plan was to drive to Yarmouth, about 65 miles southwest of Annapolis Royal, and then work our way up the coast. We figured that it would take us about an hour and half to make the drive to Yarmouth and the fog would burn off. We were wrong!!! The fog had lifted a bit but kept drifting in and out while we were in Yarmouth. Still, we walked around the town and looked at some of the historic buildings. 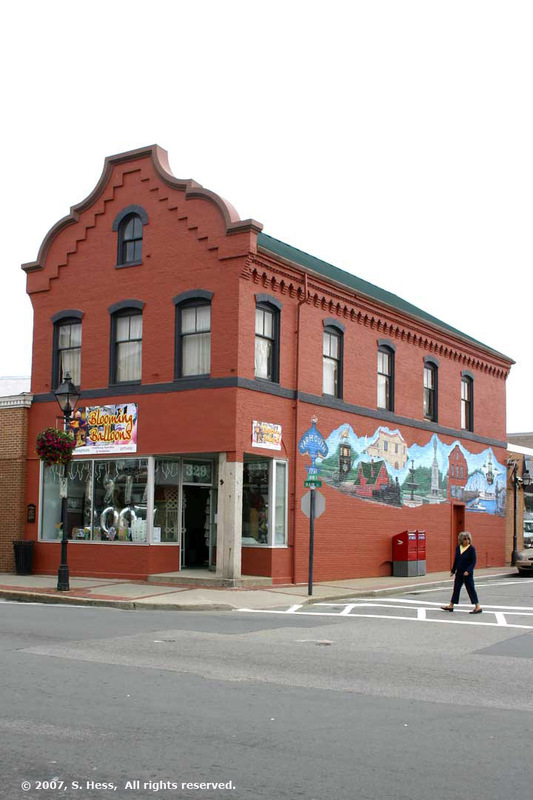 There is a 2 ½ mile self guided walking tour of the historic district of Yarmouth but we limited ourselves to Main and Water Streets. 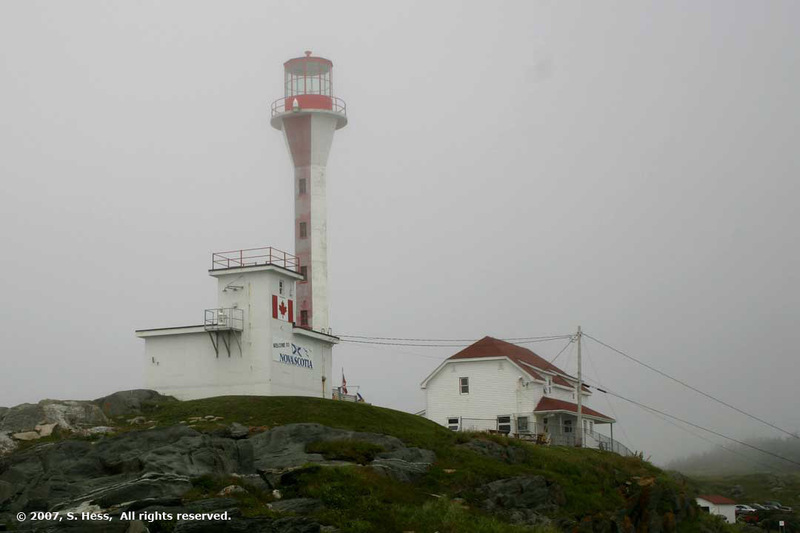 We left downtown Yarmouth and headed out to Cape Forchu and the lighthouse that guided mariners into Yarmouth Harbor. The drive was in thick fog for a good part of the route. Our luck was with us and the fog lifted enough so we could see the lighthouse. We then headed up the coast and as we did so, the fog moved offshore and eventually dissipated by the time we got back to the campground. 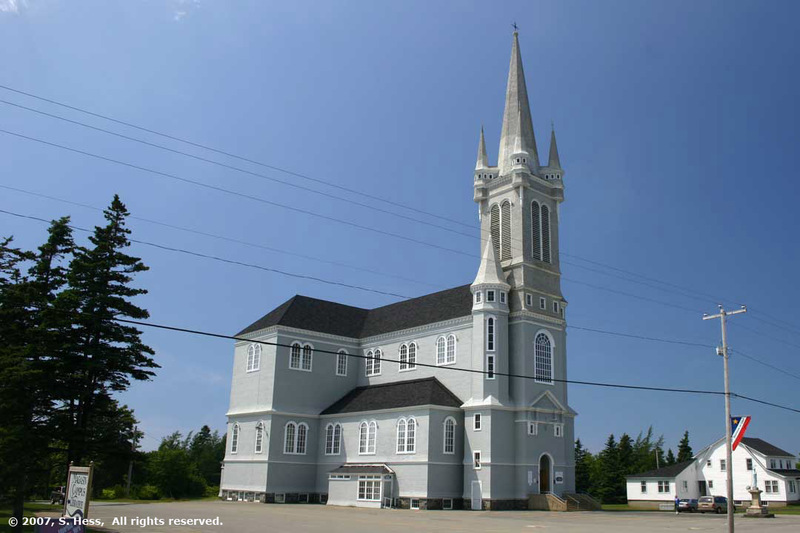 The coastal area north of Yarmouth and south of Digby is known as La Cote Acadienne, The Acadian Coast. It has the highest density of French Canadians in Nova Scotia. This is the stuff of Henry Wadsworth Longfellow’s poem, Evangeline. When the British took over Nova Scotia from the French, they deported many of the French settlers. Some went back to France, others to New England and still others to then French Louisiana (the ancestors of today’s Cajuns). Many of the deported French returned and settled back in this area. 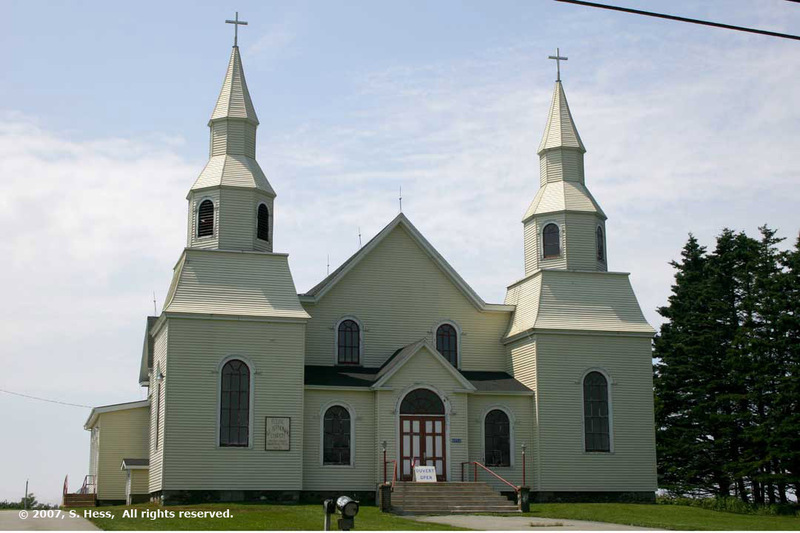 Their heritage is most visible in a number of the Catholic Churches (see pictures, below) that line Highway One, also know as the Evangeline Route. Their heritage has another interesting facet and that is the fact that they still refer to themselves as Acadians and fly their own flag, a French Tricolor with a yellow star in the blue field. These flags were flown on virtually every house in the area. Main Street scenes. 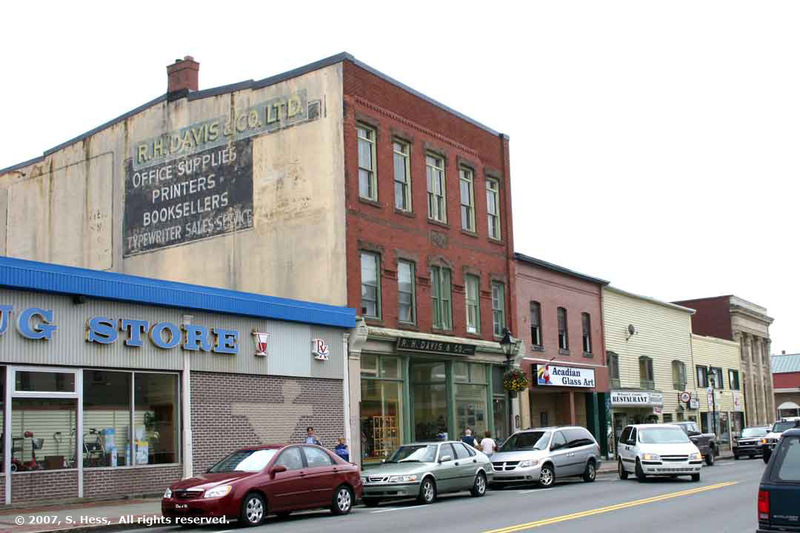 The Old Drug Store, right, is unique because it the oldest brick mercantile building in Southwest Nova Scotia and Yarmouth's only building with a Dutch style front. 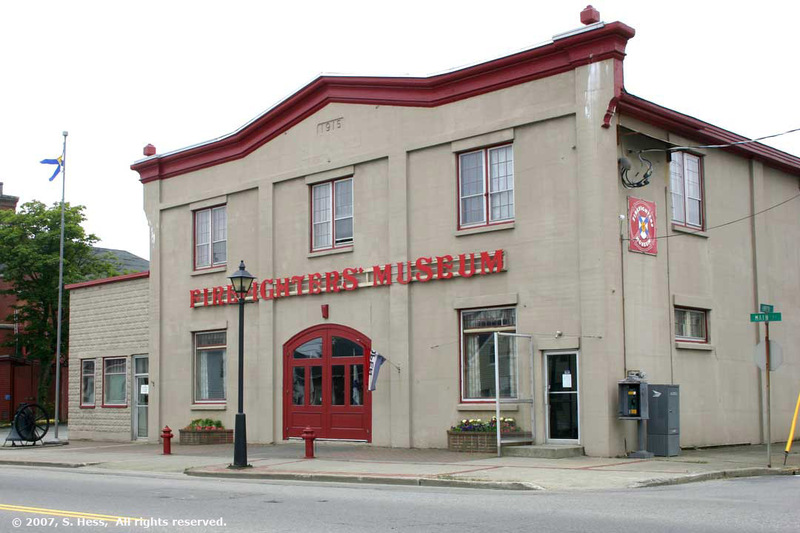 Below left is the Firefighters Museum and below right, is the old county jail. 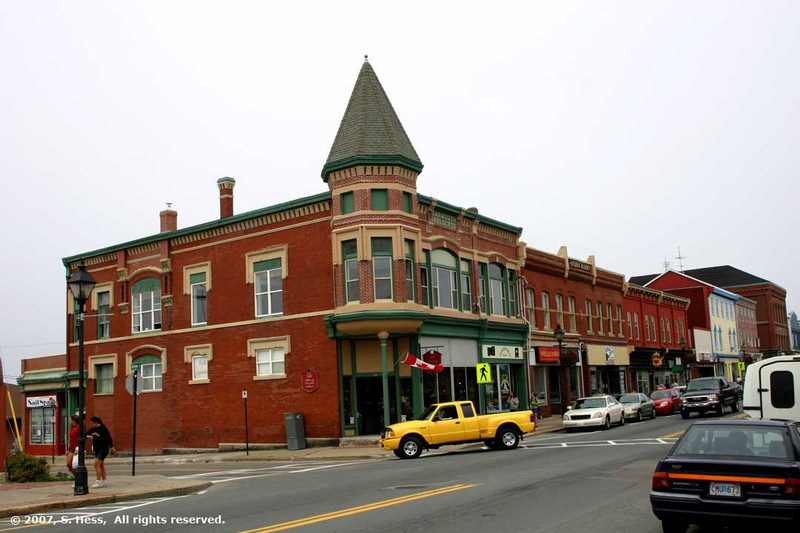 Frost Park, also on Main Street, was the first burial grounds for the town of Yarmouth. It is now a city park. 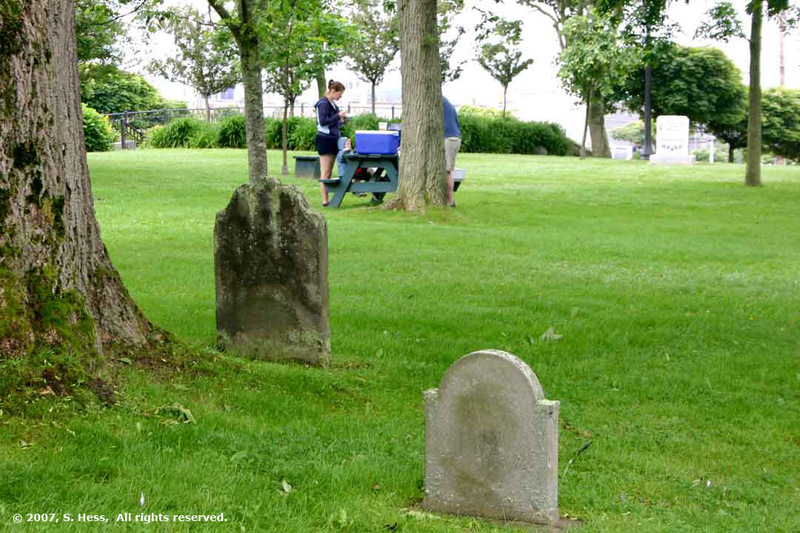 The sight of a family picnicing among headstones dating back to the mid 1700's is just not something you see every day. The Killam Brothers building. 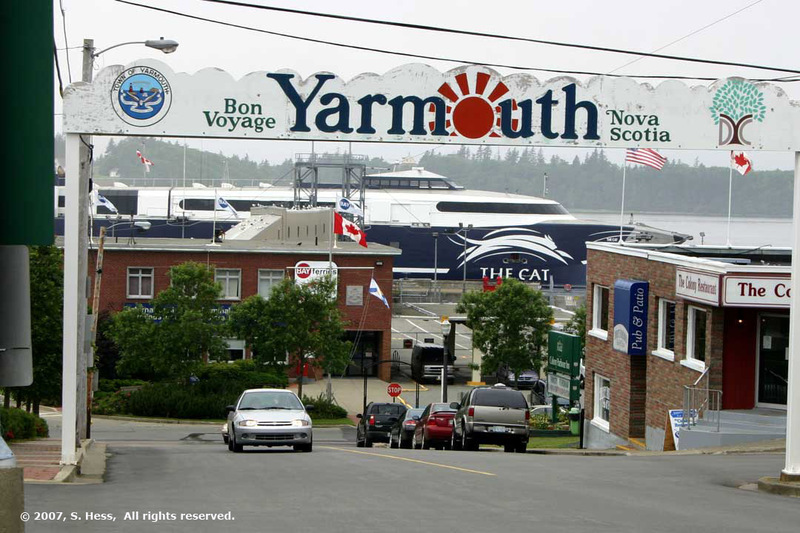 on Water Street, is significant to Yarmouth's maritime history. 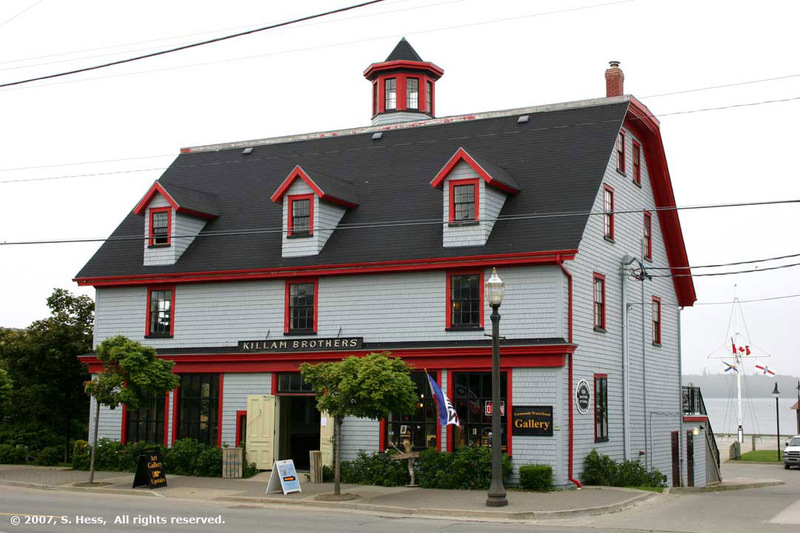 The Killam family began trading at this site in 1788 and continued until 1991. 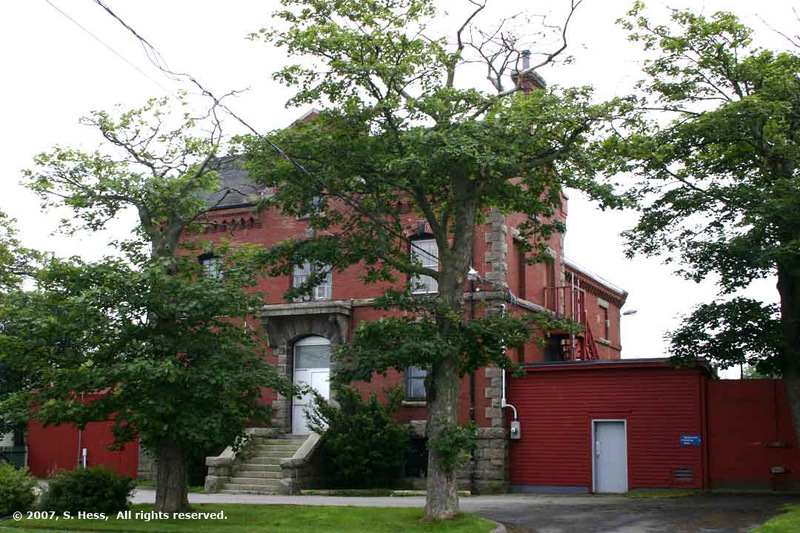 This building dates back to the 1830s and is now an extension of the Yarmouth County Museum. The Cat, a high speed catamaran ferry, runs between Yarmouth and Portland and Bar Harbor, ME. It can carry 775 passengers, 250 cars and 14 motor homes or buses. The fishing fleet appeared idle. 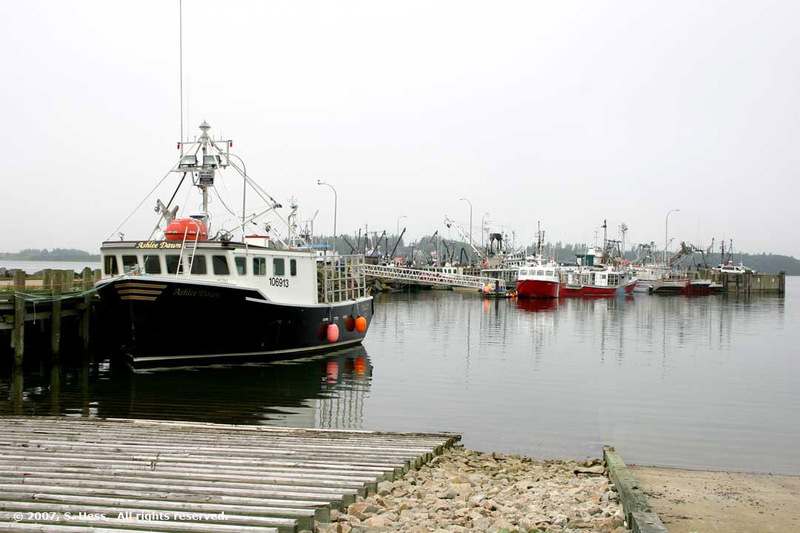 The boat in the foreground was up for sale, perhaps in response to the declining Atlantic fish stocks. 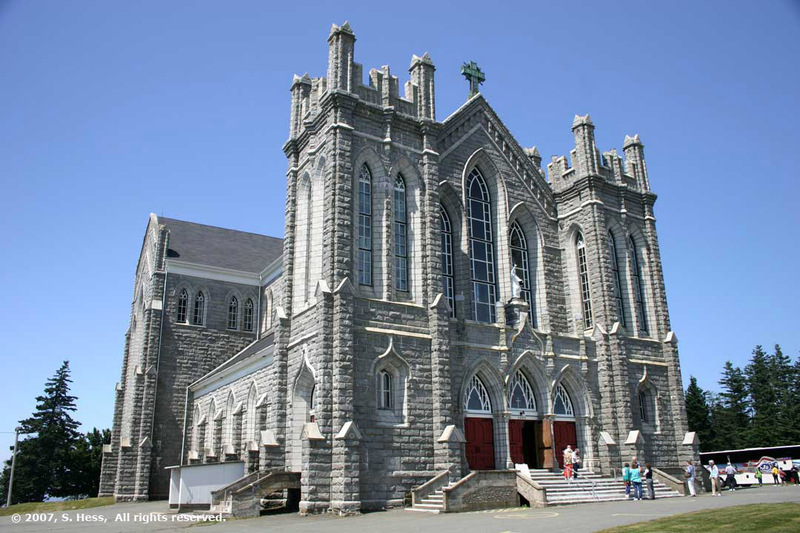 Construction of St. Bernard Church began in 1910 and was completed 32 years later. It was built by local farmers. lumberjacks and fisherman. 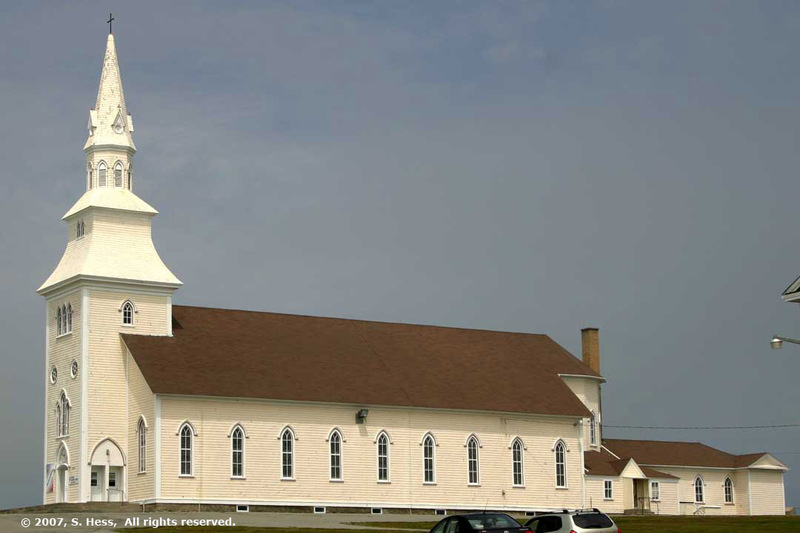 Its three foot thick granite walls make it one of the most unique churches in the area.